When I was about four, I saw that dainty ladies pinched their skirts up and walked with pointed toes (probably in a book, because all the women I knew wore plaid and denim). I knew I should be just as dainty as these storybook ladies. Daintier, even! I lifted my skirts as high as I could and pranced around like the queen of daintiness, until my mother told me I wasn't allowed to wear skirts to church if I flashed everyone. When I was about seven, I vowed that I would never, ever, ever wear jeans. Denim was entirely too uncomfortable, stiff, and modern. I preferred calico dresses, with buttons down the front. "I will not even wear jeans when I am a TEENAGER," I said. I pretty much held to it, wearing long flowing skirts all through high school and the first year of college, up until that day I cut off all my hair. This is my wedding dress design problem, see. I have too long a history with fantastic dress-ups. I know how to sew a wizard's cloak, how to turn thrift-store negligees into fairy gowns and spiderwitch tatters, how to cut a cardboard sword from the Arabian Nights. I'm getting married; I can't screw it up now. All my younger selves are standing in a dainty row, waiting to see their dreams fully realized in my wedding dress. So I lay awake at night, thinking about sashes and gores and trims and petticoats, and wondering what Mlirriiken the Wizardess would wear to her wedding. And what would you wear to a pirate wedding on the Purple Island? Or hell, to the polyandrous weddings in Midderwynn? These are ponderous, ponderous questions! I tossed and turned. I thought about buying a wedding dress. There are all kinds of professional magical seamsters, on Etsy and elsewhere, who spin gossamer gowns out of seashells and hickory nuts. They could certainly do a better job than I. I thought about embarking on the most epic thrift-store-scouring mission in the history of used clothing. Wouldn't scavenged laces and ruffles be fun, and cheaper than sewing? But that line of dainty young selves shook their heads. When would I ever again have the chance to make a dress entirely out of my dreams? On a flight home, I filled a sketchbook with drawings. 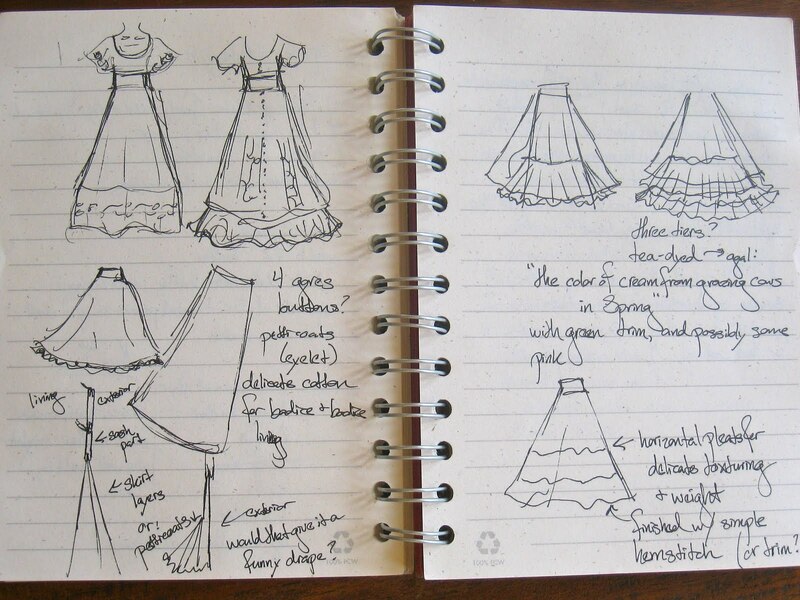 The businessmen on either side of me must have thought I was some kind of overgrown eight-year old, hurriedly filling pages with sketches of nearly identical dresses. With my imagination finally loosed, the possibilities and abstractions drove me crazy. I have designed skirts before, and designed fitted bodices before, and made dresses from patterns before. 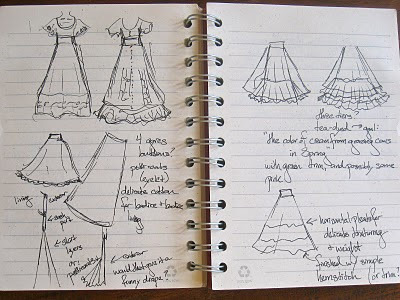 But designing a whole dress required entirely too many choices -- and I knew my vision needed to crystallize before I could set to with my scissors and pins. Also, you know how hard it is to make a flat map of a round earth? HA. Spheres are EASY. They are so predictable. Mapping a body is the real challenge. 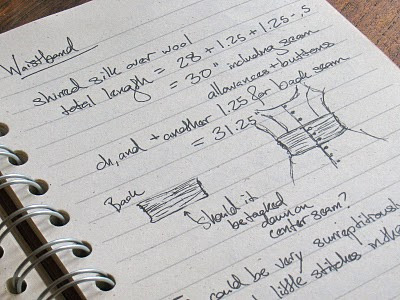 In part two: how to actually make a pattern, instead of just talking about it. This is absolutely amazing share! I loved this post and appreciate your efforts that you have put into this tutorial. At one of the NYC wedding venues we are going to get married soon and this is why have to find a mermaid inspired dress as well. I think landy bridal would be a good website. What do you think about their designs?